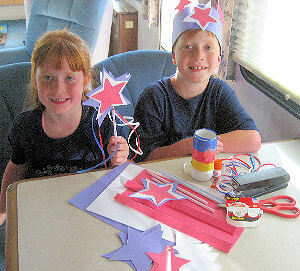 "Here is a great 4th of July craft project for your RVing kids"
Here is a great craft project to keep your RVing Kids busy getting ready for the 4th of July Celebration. For each Star Wand you will need to cut two each of red, white and blue stars, each a little larger than the first. 1. Cut two red stars using your red construction paper 3-4 inches in size. 2. Cut two white stars slightly larger 4-5 inches. 3. Cut two blue stars slightly larger 5-6 inches. 4. Use your glue stick to glue together the red star to the white star. Then glue the blue star on the back of the red and white star. Now you should have a red, white and blue star all a little larger than the red one stacked on one another. Now allow the glue to dry, then repeat for the second star set. 5. Once the glue has dried on the two sets of stars, place your straw in the middle of the star and tape it to the back of you larger blue star. Then glue the two sets together, and allow to dry. 6. Finish the star wand by taping a 15 inch piece each of red, white, and blue ribbon around the straw. Enjoy! You can also use a pencil or ½ inch wooden dowel instead of the straw. Don’t have construction paper? Then try using a piece of cardboard to cut the stars and for a different look cover them with tinfoil, or use plastic from a milk carton for the stars. Felt and craft foam will also work to make the stars. Just use your imagination and have fun! For each hat you will need to cut two each of red, white and blue stars, each a little larger than the first. 4. Use the glue stick to glue together the red star to the white star. Then glue the blue star on the back of the red and white set. Now you should have a red, white and blue star all a little larger than the red one stacked on one another. Allow the glue to dry and place on the hat band. 1. To make the headband start with a piece of construction paper, Fold in half length ways and cut in half. Now fold each piece of paper 1 inch length ways and connect the two pieces end to end to make one band. 2. Run a piece of scotch tape on the fold the length of the band for added strength. 3. Place the folded band around the forehead and measure the band to fit, overlapping the ends. 4. Then staple the band to make the base of the hat band. 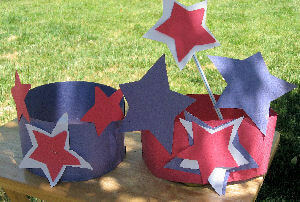 5.Glue the set of stars to the hat band and Enjoy! You can also use red, white and blue stars separately, or just red and white, or blue and white, etc. For a different look you can tape the stars to one end of the straws and then tape the straw to the hat band, or use pipe cleaners. Felt and craft foam will also work to make the stars and the hat band. Have Fun!